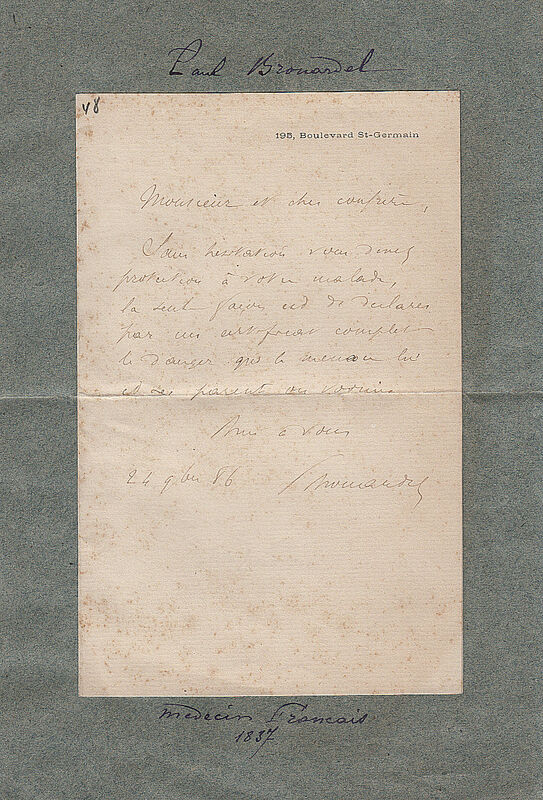 Autograph Letter Signed, to a colleague, about treatment of his illness. In French. 1 page 7 x 4 inches, the integral blank leaf tipped on to an old album page, some very light foxing. 24 November 1886. Paul Camille Hippolyte Brouardel (1837-1906), French pathologist. Brouardel was a leading authority of French forensic medicine, and was also a passionate advocate concerning all aspects of public health and hygiene. He was at the forefront of issues such as food safety, tuberculosis, venereal disease, child abuse, alcoholism and public decency. Brouardel was a major influence on the career of neurologist Georges Gilles de la Tourette.